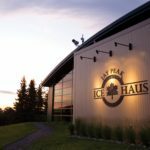 The Ice Haus at Jay Peak was a new construction with specific water and power issues caused by its placement at the base of a ski hill. On peak ski days the lifts consumed much of the incoming power to the hill so any design required a low surge on start. Water was also an issue because wells served the property and water consumption was massive for the ski hills and hotels. Energy efficient HVAC and dehumidification designs were also a key component of this project. In addition, discussions were in place for a future water park to be constructed 700 feet from the facility and the possibility of reclaiming waste heat for the pools was a consideration in the overall design. 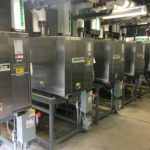 Emerald Environmental Technologiesprovided a design that reclaimed heat from the refrigeration to offset heating costs for the facility as well as act as a source for the low temperature free dry dehumidifier. This required both warm and chilled glycol from the ice3 Cube System. A single Digital Control System was chosen for both HVAC and refrigeration. The snow melt pit was designed so that shavings water were reclaimed for the evaporative cooling tower. This pit acted as the indoor water sump. By combining shavings with heat from the plant any rejection heat was first cooled by shaving water. If this was not adequate the shavings water was sent to the evaporative cooling tower to act as the water source – both thermal energy and water were reclaimed and reused from ice shavings. An ice3 Cube was used to provide air conditioning as well as a heating source. 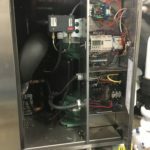 A warm glycol pump was sized with a VFD to allow transfer of warm fluid to a future heat exchanger in the water park via underground piping system. 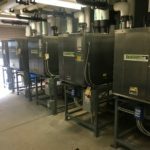 The system worked as intended and provided reclaimed heat for multiple purposes, including the (now installed) water park. The modular design allowed for staged starting of ice3 Cubes so that in rush power was kept to a minimum. 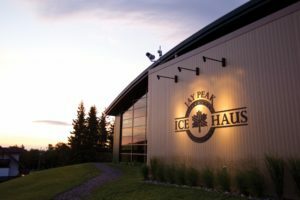 A majority of all ice shavings are reclaimed to allow for an efficient use of the water. It is estimated that 5,000 gallons of water are reclaimed in the winter and almost 7500 gallons in the summer. The water park was constructed and warm thermal energy was recaptured from the refrigeration plant. At first only a few outdoor pools and some wading pools were heated. Once it was clear that a majority of the reclaim heat was still available, the heat reclamation was increased at the water park. 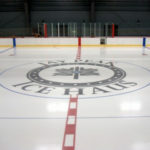 This remote facility has become an extremely busy Ice Arena and the ice3 Cube System has been a great fit with minimal maintenance and built-in redundancy.